Discover Cuenca Ecuador and BEYOND! : What is Medical Care Like in Cuenca Ecuador? What is Medical Care Like in Cuenca Ecuador? Someone asked what the medical care is like in Cuenca. We can’t personally answer this question because we have not been to a doctor or dentist, yet, but we have heard that the medical care here is very good. I came upon a great article about the medical system, which I am passing along to our readers. It lists some of the costs of medical procedures here in Cuenca. 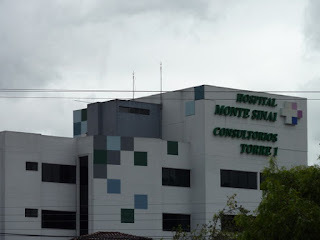 There is a huge hospital here in Cuenca called Mount Sinai and apparently they have an English speaking staff. We went inside one day to use the restroom and the first floor was like a mini mall, it was modern and sparkling clean and had a nice pharmacy. There are pharmacies every couple of blocks here, so you will not have a problem filling your prescriptions. One interesting thing about Cuenca is there are a lot of health food stores that sell all kinds of herbs, health concoctions, vitamins, and cleanses such as the Psyllium husk colon cleanse. I like psyllium husks myself and I do the psyllium husk cleanse every couple of years. I also take a maintenance dose of a tablespoon of psyllium each morning with black strap molasses because it helps keep me regular. I looked for psyllium here in one of the natural health stores and found whole psyllium husks but there are also two other ingredients in it--papaya and mangoes---so I thought that was interesting and I bought a canister of it. Here is the article I found on Cuenca Ecuador Retirement. Enjoy! Although the low cost of health care in Cuenca has long been a draw for foreigners relocating to the city, it is beginning to catch the interest of international medical tourism companies. A heart bypass: $130,000 in the U.S. vs. $10,000 in Cuenca. A heart valve replacement: $160,000 vs. $15,000. Repair of a cerebral aneurysm: $200,000 vs. $10,000. Insertion of a heart pacemaker: $150,000 vs. $10,000. Hip or knee replacement: $43,000 to $51,000 vs. $8,000 in Cuenca. What are the cost for senior health insurance?